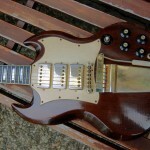 The gibson sg is one of the classic blues rock guitars of the 60ties and 70ties. 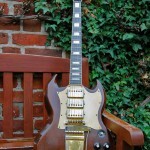 Used by players like Duane Allman, Eric Clapton, Angus Young, Pete Townsend or Tommi Iommi. 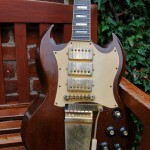 In this episode of stuff that’s gone we will look at a gibson sg custom from 1969. 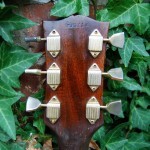 These guitars can be great playing and sounding bargains, when the players is able to cope with the narrow nut width. 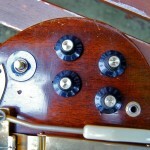 the pickups were wired to blend between the neck- and middle pickup. 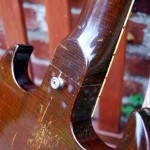 A modification which makes this guitar even more versatile. 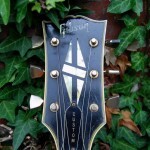 In practice this guitar was my preferred gibson guitar for approximately 2 years. Great tone from all three pat-no pickups, versatile because of the pickup blending, light weight and with good playability. 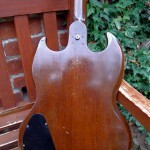 three piece mahogany neck introduced in 1969. Without volute and made in usa stamp so pre 1970. This entry was posted in gibson on 17. July 2011 by admin.